Goal: Teach your teen to move and stop a vehicle safely and with confidence on quiet roads. Location: Start in a large, level, mostly empty area. Move to a quiet neighborhood street when indicated. Out of respect to our neighbors, please do not use official state road test courses for practice. Before moving out onto the road, make sure that your teen has reviewed the driver’s manual and is familiar with street signs, signals, pavement markings, and yield and speed laws. Starting in a quiet, large, level, empty area, review the skills learned so far. Have your teen drive several laps around the lot, practicing smooth braking and accelerating, maintaining steady speeds, steering into right and left turns, and using reference points to align the car with curbs (or lines). Coach your teen to use “commentary driving” (see sidebar on page 4) throughout this lesson, if possible. When you and your teen feel ready, move to a quiet street. 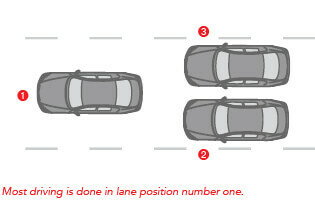 Center position ➊: The most common position, with the vehicle centered within the lane. Coach your teen that they should stay in the center position under most circumstances. Left position ➋: The vehicle positioned to the left side of the lane. This is best used when approaching parked vehicles and potential hazards on the right (if no oncoming traffic). It should be avoided on a hill or a curve. Right position ➌: The vehicle positioned to the right side of the lane. This is usually done when making a right turn to allow for a safety margin on the left side of the vehicle. Search for vehicles, pedestrians, signs, and traffic signals. Check the rearview mirror for any potential hazards behind the car. 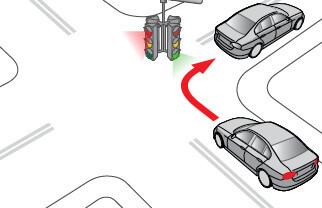 If it’s an intersection with traffic signals, identify who has the green light. If turning, put on the turn signal four seconds before making the turn. If a stop is required, stop behind the white stop line. Select the best lane for the intended direction of travel. Yield the right-of-way to pedestrians and other vehicles. Make sure your teen understands what to do if they encounter emergency vehicles. First, turn down the radio to listen for the direction of the emergency vehicle(s). Stay calm and pull over to the nearest curb, clear of intersections, and wait for the emergency vehicle(s) to pass. Goal: Teach your teen to turn both right and left safely and with confidence on quiet roads. Location: A quiet block of single-lane roads, ideally without traffic signals at the intersections. Pick a line at the center of the intended travel path while steering through a turn. Make sure your teen does not fixate on one specific spot, but instead focuses on a broader path. Focus on smooth braking into the turn and acceleration out of the turn, as previously practiced in the large, level, empty area. Always check mirrors before turns and signal four seconds before turning. Have your teen drive around the block making right turns 10–12 times. When they are proficient, drive around the block 10–12 times making left turns. Position the vehicle close to the yellow line in the middle of the road. If there is a stop sign or red light, stop with wheels pointed straight ahead before the stop line, crosswalk or intersection. Search the intersection in all directions for vehicles, pedestrians, signs, and signals. Select a gap in traffic and pull straight forward toward the middle of the intersection. Coach your teen to avoid hesitating. Use the yellow line on the street being turned onto as a target. Turn into the travel lane closest to the yellow line. When the turn is complete, let the steering wheel slide back through the hands. Pick a new target 15–20 seconds ahead in the center of the travel path and accelerate gradually. Be sure to practice with your teen in a variety of conditions, including at night and in inclement weather, as much as possible. Most drivers have a tendency to steer in the direction they look. If their eyes move to one side, the car may drift in that direction, too. Remind your teen to focus on a path line in the middle of their travel lane – and not fixate on lane lines or other objects. The rest of the area should be scanned quickly but frequently.